Panopticon are a band with members from Kentucky and Minnesota that h as had music reviewed before in this zine and plays an atmospheric form of black metal with elements of folk and Americana and this is a review of their 2017 album "Kentucky" which will be released in June as a joint effort between Nordvis Produktion and Bindrune Recordings. Americana style folk instruments start off the album along with some acoustic guitars and the music also brings in a great amount of bluegrass elements and after the intro the music goes into a very fast and raw black metal direction that utilizes a great amount of blast beats and tremolo picking. Vocals a re mostly high pitched black metal screams and they also mix the folk and metal elements together while the solos and leads are done in a very melodic fashion and the songs also b ring in a great mixture of slow, mid paced and fast parts along with all of the musical instruments sounding very powerful. A great portion of the tracks are very long and epic in length while the riffs also get very melodic at times and the songs also mix in touches of the more modern, atmospheric, and post styles of black metal and some songs also bring in folk music style clean singing and spoken word parts are also used briefly and slide guitars are added onto the closing track. 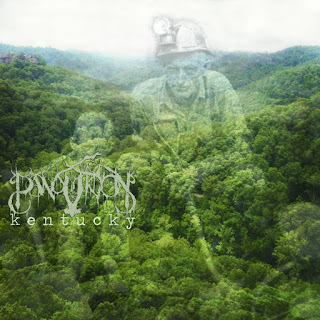 On this recording Panopticon takes their atmospheric style of post black metal and mixes it with elements of bluegrass, folk and Americana to create something very original, the production sounds very professional while the lyrics are a concept album based upon Kentucky's rich cultural history and the coalmining industry. In my opinion this is another great sounding recording from Panopticon and if you are a fan of this band, you should check out this album. RECOMMENDED TRACKS INCLUDE "Bodies On The Falls" "Which Side Are You On" and "Black Waters". 8 out of 10.